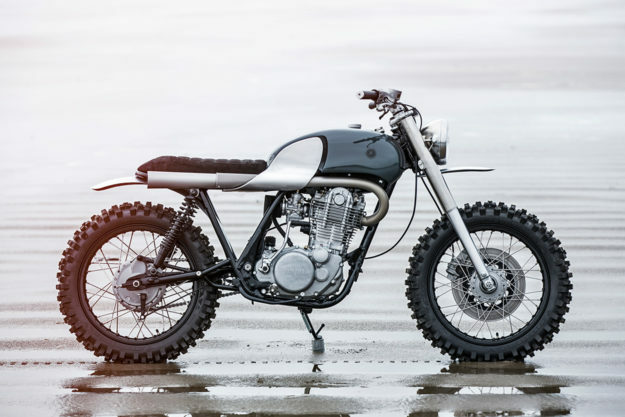 The Yamaha SR series is the two-wheeled equivalent of modeling clay. 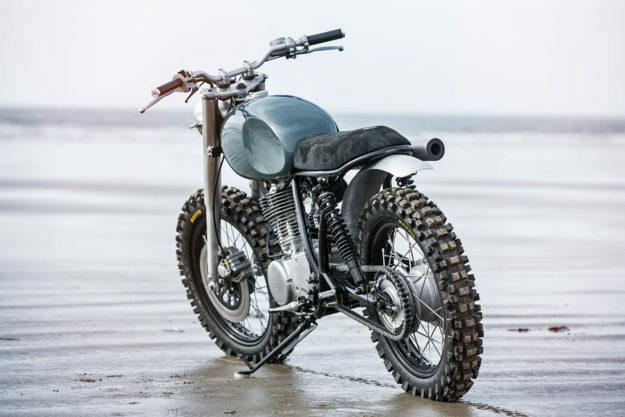 For decades, bike builders have been pushing and pulling the SR in all directions—from race track to dirt track, and all points in between. 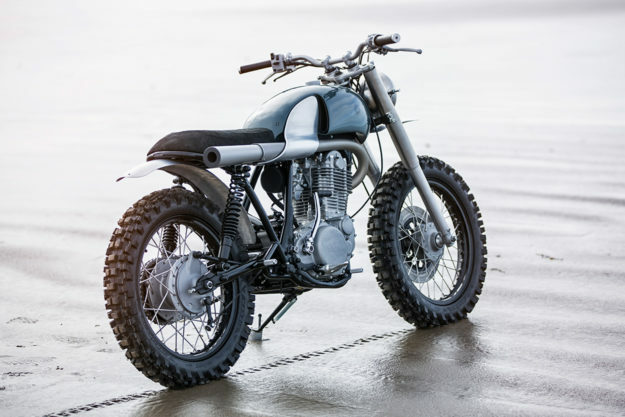 The Japanese are masters of this craft, with SR400s and SR500s helping companies like BratStyle build their reputation. But in the West, we’d argue that Auto Fabrica is at the top of the pile. 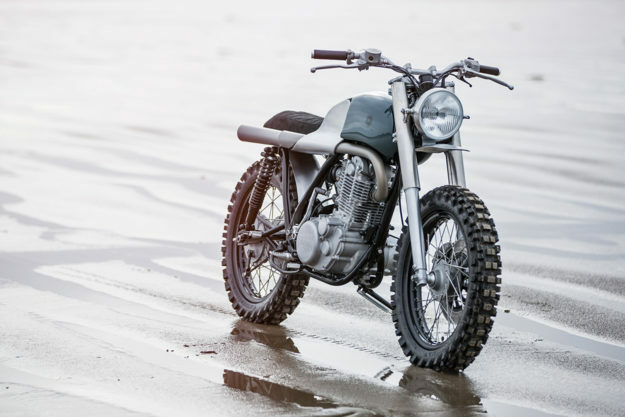 This time round, the influence came from the scramblers of the 1960s—as seen through the lens of Auto Fabrica’s impressive design sensibilities. 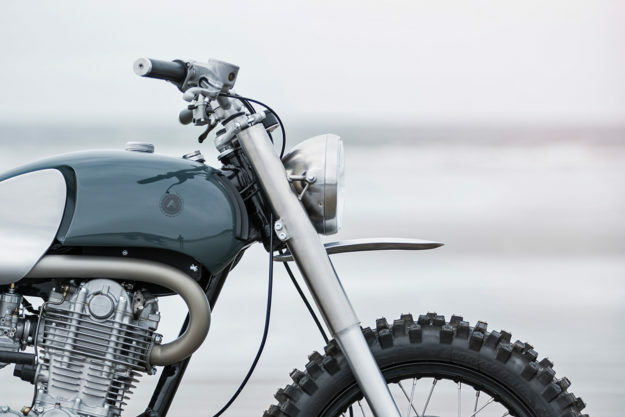 The custom bodywork is handmade from aluminum, and the level of craftsmanship is amazing: this bike is one of the few that could hold its own at a design exhibition as well as the dirt track. The multiple curvatures on the tank allowed Auto Fabrica to flex their design skills, experimenting with floating surfaces, and inlets and outlets. A designer’s field day. Concealed at the front of the tank is an aluminum scoop, finished in matt black and adjustable by 30 milimeters (just over an inch). This draws in air, and can be changed according to the time of year and climate. Part-way down the right-hand side is a similar inset surface channel, which allows air to exit after flowing around the fuel cell. 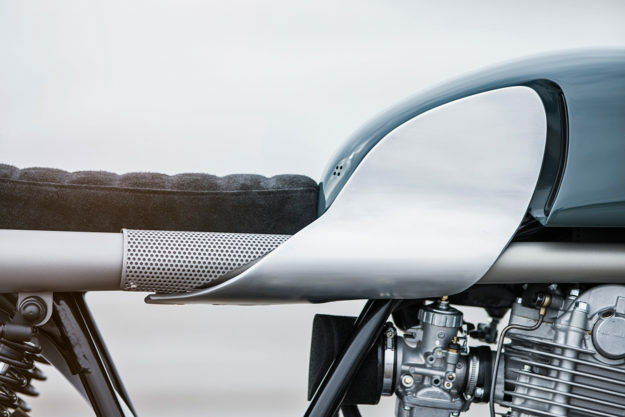 “The major design statement is the exposed aluminum surface, which doubles up as a knee guard for the exhaust. We like to add complexity in order to achieve something simple in our designs.” The visual flow is unusual but immaculate. The seat, by comparison, is conventional—and thickly padded. Not only for rider comfort, but also to balance the visual mass of the bike. It’s been finished in a tough reversed leather, with a discreet aluminum Auto Fabrica logo stitched into the rear of the top panel. The forks have been shaved and reworked, with uprated springs installed. and the stanchions have been re-chromed. 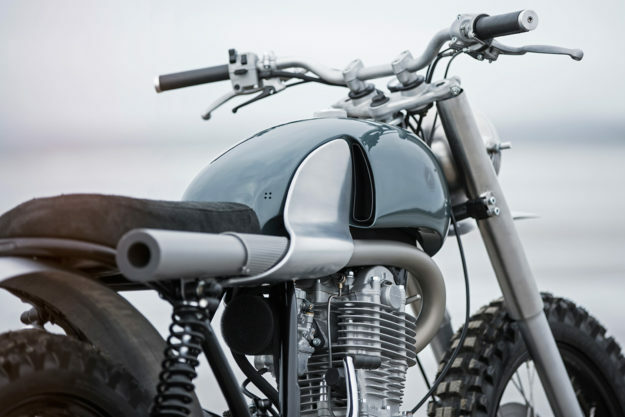 There are custom stainless fork mounts to simplify the front end visually, with matching headlight brackets. The shocks are all-black units from Hagon, slightly raised over stock, and in perfect alignment with the frame tubes. It goes without saying that the hygiene items have been taken care of. The frame has been reworked, with all unnecessary parts removed or relocated out of sight. A new wiring loom (with a re-wound generator) links the electrical components under the tank. The engine’s been treated to a full strip and rebuild. The casings have been aqua-blasted, and inside are new bearings, valves, valve seats and springs. There’s a new piston to keep compression high, and a fresh clutch to provide years of maintenance-free riding. The carb is a new VM34 Mikuni: “Performance wise, the bike has a much more responsive engine,” we’re told. 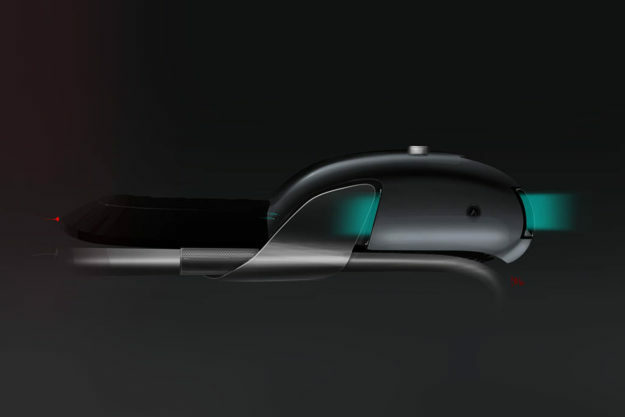 The smaller fabricated elements are low key: foot controls have been reworked with custom knurled aluminum pieces, and there are custom passenger pegs too. 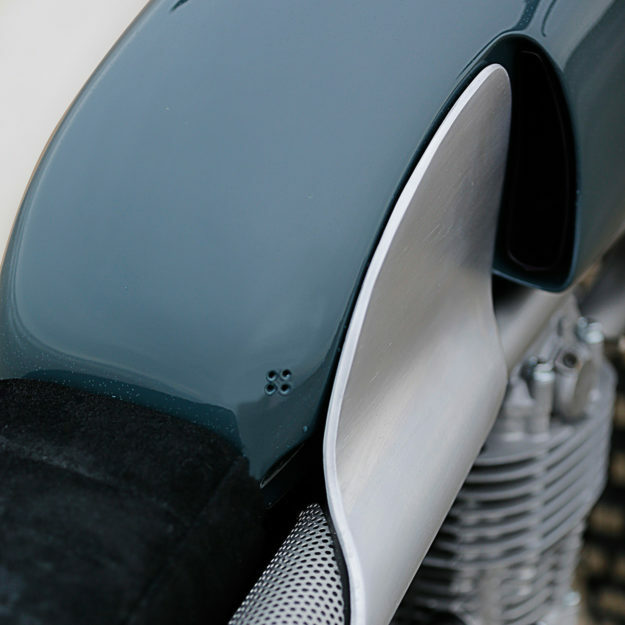 The front and rear fenders are hand rolled aluminum—left raw to complement the rest of the aluminum work. In the lightning department, there’s a tiny LED taillight and small LED indicators front and back. 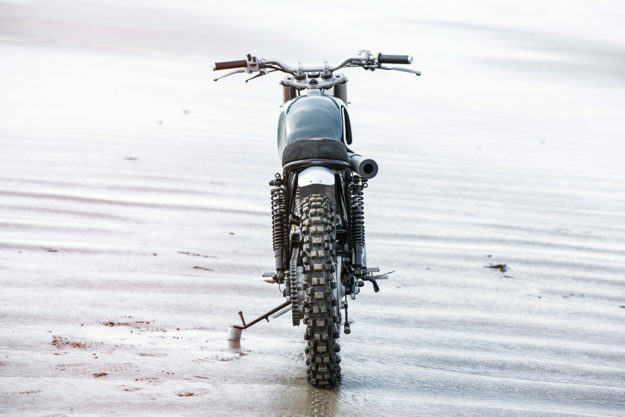 A Motogadget Tiny speedo sits above a modified front yoke and ahead of Renthal bars with custom leather grips. 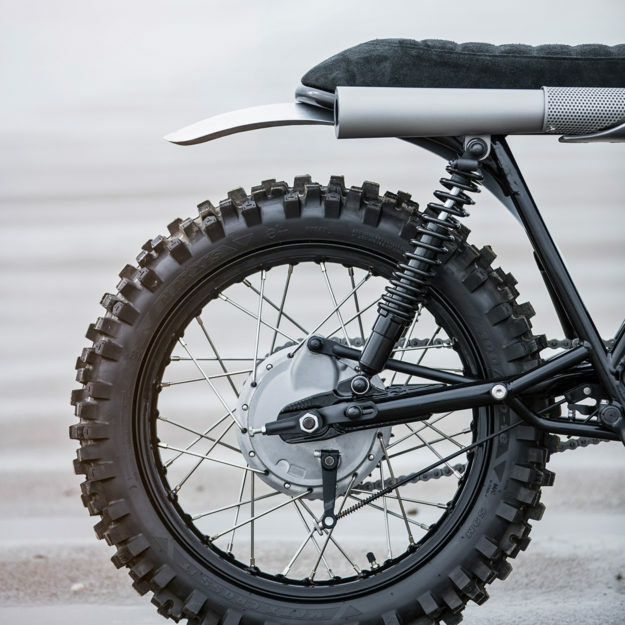 Everything on this SR is about balance, and that extends to the matching wheels—18 inches fore and aft, with stainless spokes and alloy rims, shod with chunky Maxxis rubber. 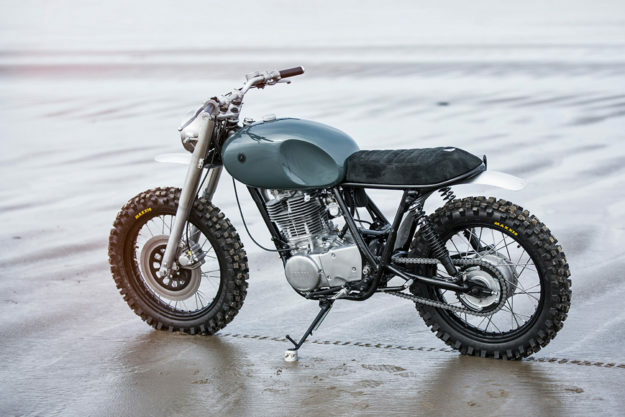 We’d take this over a dayglo plastic-clad modern enduro any day. If you feel the same way, drop Auto Fabrica a line via their website—this little masterpiece is soon going on sale.